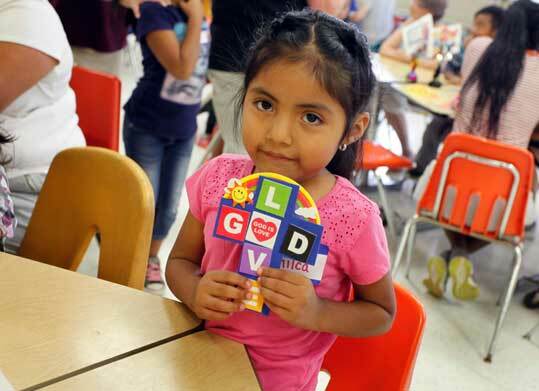 Once upon a time, in a poor community along Virginia’s Eastern Shore, a teenager working on a high school service project gathered five young children from her Spanish-speaking neighborhood for afternoon tutoring sessions at a nearby United Methodist church. 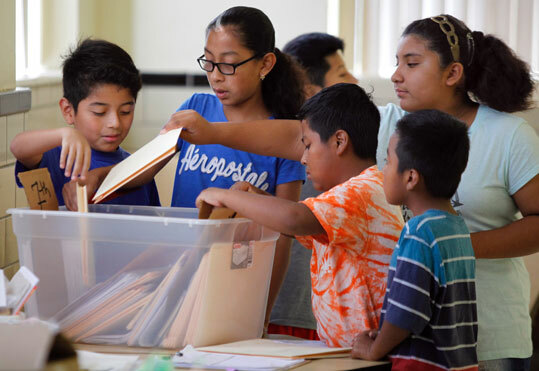 As the students’ academic skills improved, word of the program spread among Accomack County’s Latino parents, many of them immigrants who had struggled to help their children with English, math and other school assignments. Within a few years, the once-tiny service project had blossomed into a full-blown regional ministry. The ministry, called Una Familia, offers help to 130 elementary-through-high school-age students at five area churches, a small scholarship program, and advocacy and translation services for families. Its leadership now wants to help even more people by addressing the need for affordable housing and by expanding into a neighboring county. With these ambitious goals in mind, several of Una Familia’s team members attended a pilot program called Ministry Accelerator in January 2017. 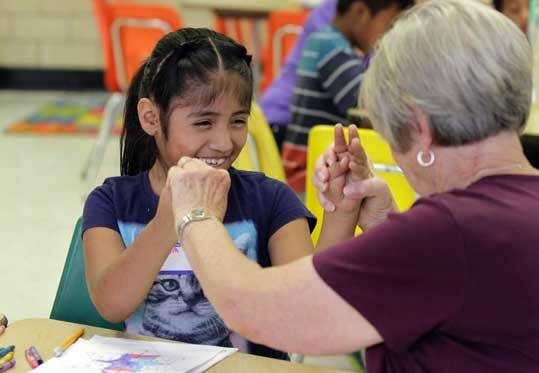 Tutor Walta Pruitt helps a girl with vision issues count using her fingers. Sponsored by the Virginia Conference of the United Methodist Church, the Ministry Accelerator is a model, borrowed from the business world, that was designed to introduce ministries to the principles and skills that help spur growth. Accelerators are similar to incubators, but they focus on growing established organizations rather than launching new ones. During the two-day Ministry Accelerator event, leaders of Una Familia learned the art of sharing their ministry, as well as other skills needed to recruit volunteers to the effort, inspire community support and, hopefully, entice financial investors. “We really were able to focus a little bit more on telling our story, why we exist, and really exploring who we are,” said the Rev. Veronica Barrell, who chairs the board of Una Familia, a program of the Eastern Shore District of the United Methodist Church. Are you able to articulate your “why” -- your story -- to others? Since then, Una Familia has redesigned its logo and created a brochure to help spread the word, Barrell said. The ministry also has begun taking steps to establish itself as a legal nonprofit separate from the church. That way, she said, as Una Familia begins the expensive process of addressing the affordable housing need, it can tap into funding from organizations and large companies, including several major employers along the Eastern Shore, that can’t or won’t donate to a religious organization. The last two hours at the community center is for crafts and games. This little girl holds up what she made during craft time. Like other participants, Una Familia was invited because it received a grant funded by the Virginia Conference of the UMC. The voluntary Ministry Accelerator is a new addition to a long-standing grants program. The grants, roughly $100,000 annually, support new outreach ministries for up to three years and provide some ongoing funding for programs that can’t yet stand on their own. “Ultimately, a big success would be that they didn’t need to come to us anymore; they would become self-sufficient,” said the Rev. Marc Brown, the board chair of the Common Table for Church Vitality, the Virginia Conference’s primary administrative body. “The other ultimate goal would be that they could teach other nonprofits and church ministries how to do their work,” he said. Helping ministries evolve was exactly what the Rev. Chris Bennett had in mind when he proposed the Ministry Accelerator concept in 2015. The grant recipients were doing good work in their communities, he said, such as providing meals, educating children, repairing homes and offering financial counseling. But, he wondered, what if they had the tools to take their ministries to the next level? “What would it look like if instead of giving them this money, we built capacity?” Bennett said. Children at Una Familia start the day by retrieving their individual work folders from a plastic bin. Through a seminary friend, Bennett met Todd Nuckols, the director and founder of Lighthouse Labs, a Richmond nonprofit that’s one of the country’s top-ranked startup accelerators. Each year, Lighthouse Labs hosts a 13-week business boot camp in which business founders live in Richmond, sharing work space, meeting with mentors, receiving guidance on how to improve their products or services, networking with investors, and ultimately, transforming an idea into a high-growth venture. Nuckols, a lifelong Southern Baptist, agreed with Bennett. The same commitment to service and excellence, the same emphasis on relationship building, and the same “ruthless focus” required to accelerate a startup operation could benefit nonprofits, ministries and other “world-changing organizations,” he said. In addition to capital, Nuckols said, the accelerator concept is based on three other c’s: connections with mentors and entrepreneurial peers; capability to market an idea and think big; and a community of supporters who can assist when needed. Bringing like-minded ministries together for an accelerator-like experience would teach them to leverage all those pieces in the same way businesses do, he said. “I’ve always had a passion for ‘How do you engage the broader congregation and laity?’ Acceleration allows for that. They can be mentors; they can provide connections; they can provide capability to these organizations,” Nuckols said. Buoyed by Nuckols’ enthusiasm, Bennett first approached the grants subcommittee, then followed up with the Common Table, which provides nearly 70 percent of the money for the grants. “Rather than just giving money, we also wanted to help offer leadership. It fits right in with what we’ve been focused on for the last 10 years,” Brown said. Bennett and Nuckols condensed the three-month Lighthouse Labs curriculum into a two-day program geared toward ministries. They also enlisted the help of John Sarvay, the founder of Floricane, a Richmond-based strategic planning consultancy, who also volunteered his time for the effort. While the team wanted to share some broader concepts -- best practices for recruiting, training and retaining volunteers, for instance -- the Ministry Accelerator, just like a startup accelerator, would provide advice tailored specifically to each ministry that participated. Working alongside mentors from the startup community, each ministry is encouraged to think critically about how it measures success. What is the one thing you can measure that would make a significant difference in your impact? For instance, Bennett said, a soup kitchen may count the number of meals it serves each week. But what if the soup kitchen were to focus instead on a more transformational measure, like how many people no longer come to the soup kitchen because they can help themselves? Once that “metric” is established, each ministry is asked to identify the action that must be taken -- the “lever” that must be pulled, in accelerator-speak -- to improve that metric. So in the case of the soup kitchen, what lever must be pulled to increase the number of people who no longer rely on it? Perhaps it’s building relationships with those clients to identify the underlying issues that drew them to the soup kitchen, and then focusing the ministry on addressing those needs. Next, exactly what steps is the ministry going to take over a designated time period to pull that lever? Neighbors Helping Neighbors, a construction ministry based in Lunenburg County, about 35 miles from the North Carolina border, had been repairing homes in the community for about seven years when some of its leadership team members attended the first Ministry Accelerator in 2016. The ministry, a community effort organized largely by Kenbridge United Methodist Church, raised money year-round for its signature project -- a weekend during which dozens of volunteers painted homes, built handicap-accessible ramps, cleaned yards, and repaired floors and siding for low-income residents. During the rest of the year, if folks called the ministry with home repair needs, volunteers would essentially add them to the list of potential project sites for the big weekend. At the accelerator, team leaders quickly realized that if they addressed small repairs for people year-round, they could help more residents and save the bigger, more complex projects for the traditional weekend, said Kenbridge UMC’s pastor, the Rev. Tim Beck. As you accomplish tactical objectives -- feeding people, fixing homes, tutoring children -- are you pausing to reflect on long-term operational strategies? After the accelerator program, Beck tapped a volunteer to head up a small-projects team, which fields requests to fix falling gutters, crumbling porch railings and the like as they arise. It also uses its contacts in the community to find contractors who are licensed to do work that’s too dangerous for their volunteers, he said. The ministry learned to avoid duplicating services. So, for example, it still collects winter coats and goods for the food pantry but hands those items over to other established ministries to distribute, Beck said. “One thing the accelerator program helped us realize was there’s already a network of organizations that do things that we don’t really need to do,” he said. At the same time, they diversified when they saw gaps they could fill, such as by cutting firewood all year long to share with needy residents in the winter. Participation in the Ministry Accelerator program has been voluntary for grant recipients since the pilot began in January 2016, but it is strongly encouraged, said Brown, of the Common Table. In 2016 and 2017, about 25 percent of grantees attended. This year, the program included a follow-up meeting in May to check in with the ministries, providing some accountability and encouragement after the initial event, something they plan to continue. After 14 years as a full-time pastor, Bennett went to work this summer for The Spark Mill, a Richmond-based strategic planning consulting firm whose clients include nonprofits and faith groups. He remains an ordained elder within the United Methodist Church and will serve as chairman of the Common Table’s grants subcommittee during this third year of the Ministry Accelerator. He hopes that one day it will attract participants from other United Methodist Church grant programs, and even ministries from outside denominations. If the Ministry Accelerator is successful, he said, organizations like Una Familia and Neighbors Helping Neighbors will be self-sustaining, adept at transforming their communities and willing to mentor and inspire newer ministries down the road. “In the church world, we get so insulated, so inward-focused, we just assume that everyone thinks and acts like us. The rest of the world around us is moving forward, and we’re still in the 1950s,” he said. What is the one thing you can measure that would make a significant difference in your impact? Maybe it’s increasing your volunteers, your funding or your partners within the community. Find that metric and focus on it. What capability do you lack that you think you need? Are you clear about why your organization exists? Are you staying focused on that “why”? Can you move from impactful to transformational? What would that look like? Sometimes, Bennett said, that means shifting your focus -- for instance, from increasing the number of people served by a food pantry in the short term to decreasing the number of people who need that food pantry in the long term. Whatever your measure of success, that’s the thing you strive for. So, he said, make that measure meaningful.